Herbal Dietary Supplement Not Just an Ordinary Syrup! Since 1974, Traditional Medicinals has been offering the highest quality traditional medicinal herbal teas available in America. Now, This same laboratory-tested Throat Coat Herbal Tea formula is available in this convenient ready-to-use liquid syrup form, delivered in a sweet tasting base of kosher glycerin and organic honey with Organic peppermint leaf essential oil. When you don't have time to make Throat Coat tea, try Throat Coat Herbal Syrup or alternate with the tea throughout the day. 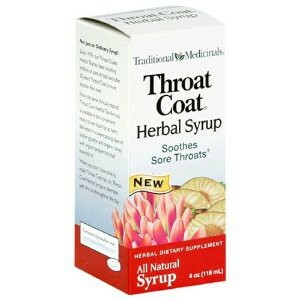 Throat Coat Herbal Syrup contains herbs with demulcent(soothing)action, providing a protective coating on the membranes that line the throat, combined with the cooling effect of menthol from organic peppermint leaf essential oil. Throat Coat Herbal Syrup is a Traditional Herbal Medicine (THM) made from medicinal grade herbs-the only class of herbs that can be relied upon as medicine to provide their specific health benefits. Traditional Medicinals combines traditional knowledge with modern science to create effective medicinal herbal products that you can trust. Disclaimer These statements have not been evaluated by the FDA. These products are not intended to diagnose, treat, cure, or prevent any disease.